Okay, well maybe that title is a little dramatic, but I am pretty excited about adding some more greenery to this little nook near the kitchen and laundry room. The herbs you see in the photo below have since gone to live outside and things are looking a little stark. I’ve always wanted to try my hand at starting seeds indoors, but it’s hard to find a sunny spot that’s not vulnerable to cat attacks. 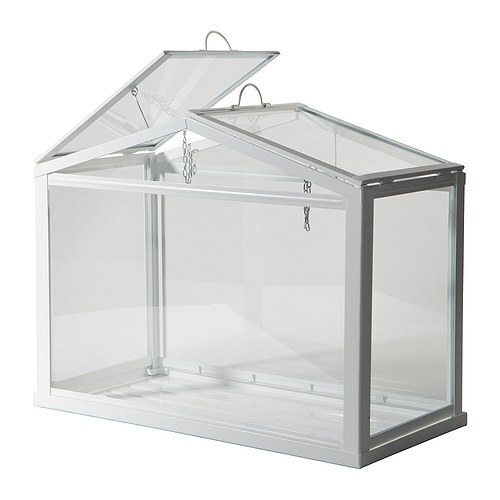 This tiny greenhouse from Ikea is adorable and only $20! My friend Lauren (in Atlanta) picked it up for me this weekend and I can’t wait to get it when I see her in a few weeks. I think it’s much smaller than it appears in the photo below–the measurements indicate it’s actually about the size of that basket of herbs I had there before. I think it’ll be a really cute addition to the room and a fun spot to nurture tiny seedlings. 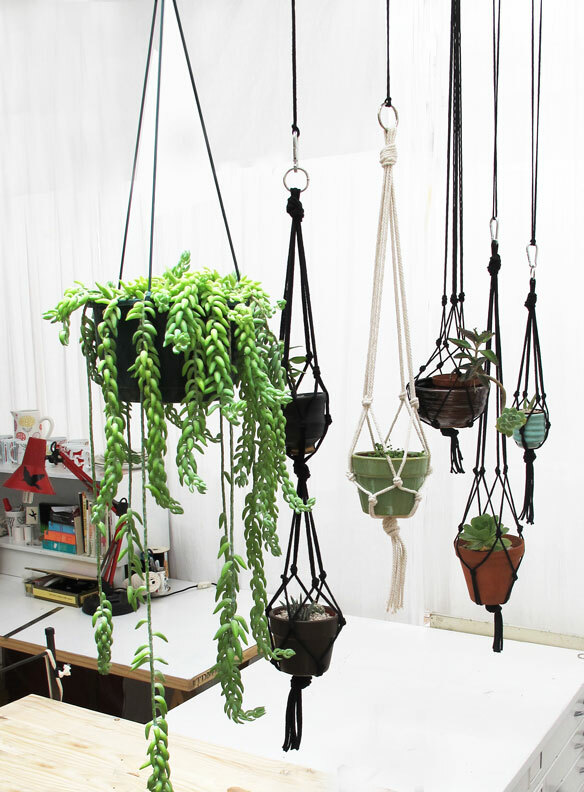 Another thing I’ve always wanted–a macrame plant hanger! Call me crazy, but ever since I saw a cluster of them hanging in one of my grandparents’ friends’ homes twenty years ago I’ve dreamed of having some macrame of my own. Sadly, I’ve never had the opportunity. Until now! This spot is perfect for a hanging plant (or two or three, but I’ll start with just one). I’ve been googling tutorials and I’m planning to get my macrame on ASAP. I just gotta get some cord to use first. What else should I put in this little nook? Maybe a happy poster or art print? A shelf or two? I think I need to wait and see how it comes together with the greenhouse and the hanging plant(s). There’s so much function jam-packed under that wood counter that I’m not too worried about what happens up top. I actually kind of love keeping the counter as clear as possible for a nice breath of fresh air between the often-cluttered kitchen and laundry areas. Plus the cats just love to lay in front of the window and look out. If you’re new here and wondering what the heck is behind that fabric skirt you can check it out here. This has quickly become one of my favorite spots in the house! I hope you all had a lovely weekend. We had so much fun celebrating Nick’s first Father’s Day and taking some family portraits with my friend Brandi, but it wasn’t all rainbows and sunshine thanks to the LSU Tigers losing their first game in the College World Series and Jack and I both being sick with a cold. Luckily, the CWS is double-elimination and a little cold is nothing that plenty of rest and fluids can’t fix. Thanks for reading, y’all. See you tomorrow! She makes a verbal mistake about the lengths of cord, but corrects herself in the comments… you’ll notice. I used 25 ft. cotton clothesline from the home depot cut into 4 equal lengths (i.e. I didn’t measure 52 inches like she says, I cut the clothesline in half, and then each half in half again). You’ll be addicted to knotting those silly things, that’s for sure. LOVE! I can’t wait to make my own!